Long thought of as Manhattan Beach’s go to shopping destination, The Beehive remains one of the hippest retail stores on the California coast. Located just blocks from the ocean, the store’s retro style attracts locals, tourists and even the occasional celebrity. Known for discovering the newest designers and the freshest looks, The Beehive is famous for its laid back attitude, incredible gift ideas and signature candy counter. 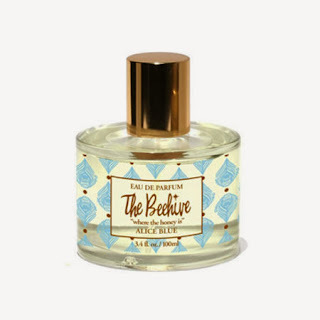 Designed by Beehive's co-owner Nancy McFarland in playful liberty prints, there are three Beehive scents: Honey Blossom, Alice Blue, and Lulu Lemondrop. Local customers have always known that whatever they crave The Beehive- is where the honey is! Alice Blue eau de parfum is a deliciously fresh floral bouquet dipped in vanilla and honey. Top Notes: Fresh green notes with a delicate fruity touch. Middle Notes: Floral bouquet with Jasmine, Rose, Tuberose, Lily, and Ylang-Ylang. Base notes: Woody accord of Sandalwood, Cedar Wood, rich Musk, deep Amber notes, and a hint of warm Vanilla.